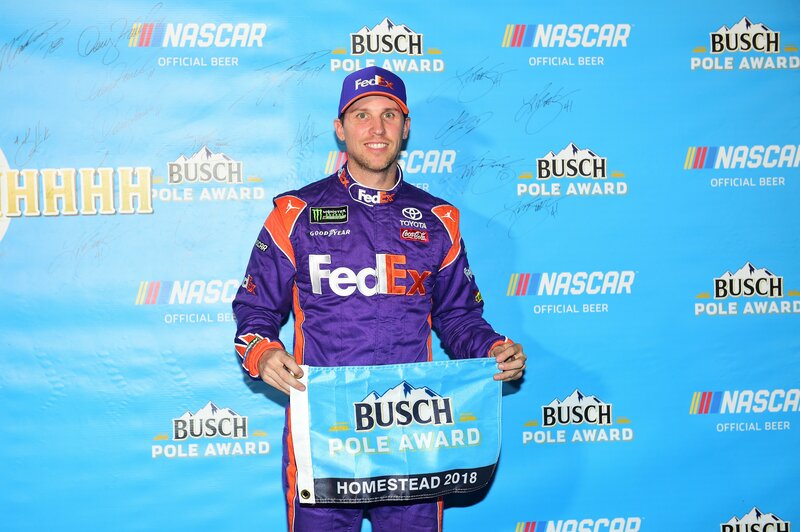 Oval NASCAR NASCAR Cup Series Denny Hamlin grabbed the pole at Homestead; Will he leave the first pit stall for his teammate? Denny Hamlin will start from the pole position at Homestead-Miami Speedway. That means absolutely nothing as far as the race goes. However, being the pole sitter does come with a huge perk. The #11 team will be the first team to pick their pit stall. 39 of the 40 pit stalls are exactly the same. The exception being pit stall number one which has a huge advantage on every pit stop. Denny Hamlin and Kyle Busch are teammates at Joe Gibbs Racing. Busch is racing for a championship, Hamlin is not. 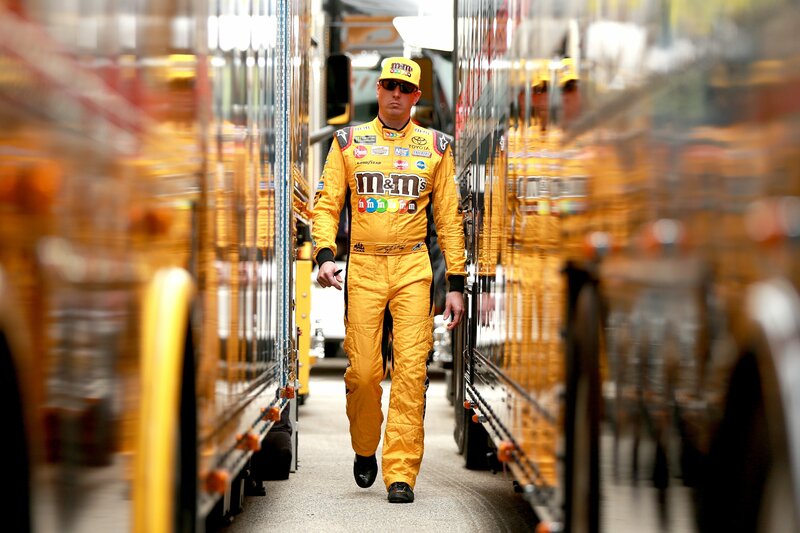 Will Kyle Busch ask Hamlin for the first pit box? “It happened to him last year. It happened to me this year. With Denny, both times, being able to get on the pole. They’ll have that pit selection and we’ll have to figure out where we’re going to pit from,” Kyle Busch said after qualifying in 2nd to his teammate. That is met with laugh’s all around, including from Kyle Busch. Busch: “I think if you’re not in the number one pit box then 2-40 are the same,” Busch concluded. “I don’t think we’ve learned a whole lot about the race today,” Truex concluded. A championship is the highest prize in NASCAR. It could mean a multiple million dollar payout for your race team. The TV money is due to be unloaded with the championship check. My point is, it wouldn’t be a complete loss for the #11 team to help Kyle Busch win the championship. But, I also don’t think he needs to rollover and play dead for any of the championship 4 either. Is there thoughts from Hamlin on leaving pit stall number one for the 2nd place qualifier of Kyle Busch? “There’s thoughts. The #78 was in the same position last year. He asked us, we declined,” Denny Hamlin said from the Homestead-Miami Speedway media center. How is it being the fast guy at Homestead while racing around the four playoff drivers? What is the Etiquette? The highest place finisher of the championship 4 drivers will be crowned the 2018 NASCAR champion. In the middle of that, there’s 36 other drivers who are there to race as well. A win would be big for Hamlin. He’s grabbed a win in every full-time season since 2006. Yet, this year he’s without a win heading into the final race of the year. 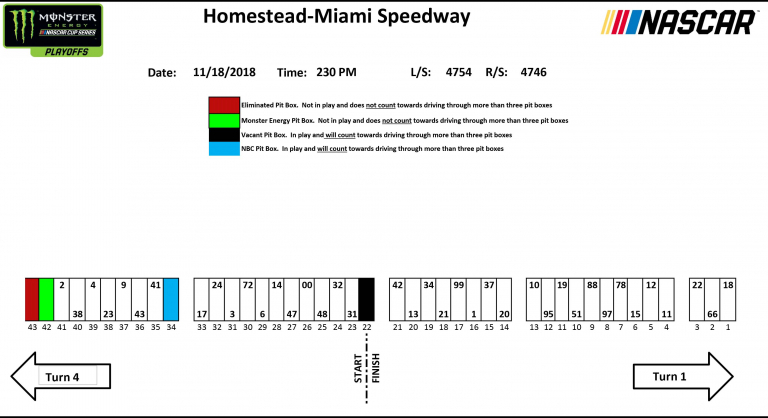 Denny Hamlin and the #11 team were the first team to select a pit stall at Homestead-Miami Speedway. They have not selected the #1 pit box. That left it open for his teammate Kyle Busch who will now have the best pit stall at the track this weekend. As of now, there’s no rule against this in the Monster Energy NASCAR Cup Series. In the NASCAR Xfinity Series and the NASCAR Truck Series the Championship 4 must pick a stall before all the other drivers regardless of where they qualified. Team owner Joe Gibbs said it was a team decision.